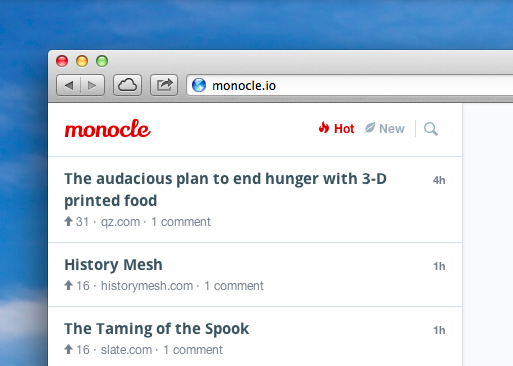 I’ve been working on a project called Monocle these past few weeks, and it’s time to show it to the world. Monocle is an experiment in creating a friendly and intelligent community around sharing quality content with a focus on technology, startups and frankly anything that appeals to the inquisitive mind. Over the next few weeks I’m going to be writing about the more interesting aspects to Monocle, but for now I want to talk about the motivations behind it. 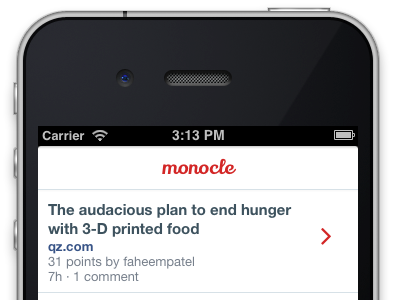 The motivation for developing Monocle was to create a friendly and safe place for ideas and feedback. Criticism is kept to the constructive variety, and social accountability is provided by linking your Twitter or GitHub accounts. There can be too much negativity in the tech community. It seems the average response to someone out on a limb, showcasing their latest idea or startup, is one of snark and derision. That is no way to foster an entrepreneurial spirit. Monocle is an attempt to remedy that. When an article is added, a summary of the content and an image is pulled in. Speed is critical: search is practically instant, posts are pre-loaded and pages pre-rendered. There are keyboard shortcuts for practically everything (press shift + ? for help), and there’s also a mobile optimized version. Monocle’s beautiful design is done by the talented Greg Cooper. The backend is all Sinatra, and the front-end uses a custom MVC framework and templating library. Users can post links, comment, and browse articles. For the moment, you need a beta invite to contribute, but everyone can read the content. I’m incredibly excited about the direction Monocle is heading in. The key component is in its community, and I look forward to seeing it grow.